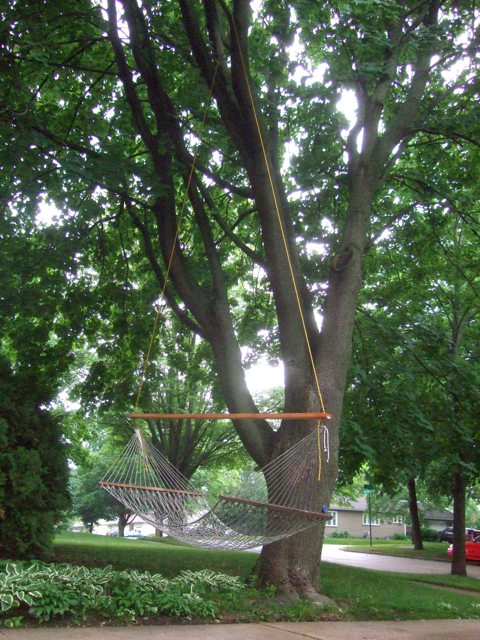 I used to have a low hammock in my back yard, hung between a couple of tree stumps. Although the stumps were as tall as a grown man, the hammock was attached directly to each one, so there was no extra height to the pendulum of the swing. Having recently had those stumps removed, I wanted to hang the hammock in a new place from a high location, so that the period of the pendulum would be long, and so swinging motion would be as long as possible. Although my street is a former woodlot chock full of very tall trees with sturdy branches, my property is conspicuously void of trees in the middle of the yard, and all overhanging tree limbs have been cleared. Presumably, a former owner wanted trees along the perimeter but an open, sunny center. Nevertheless, it is in fact the only branch on the only tree which extends even a little bit over my property, and so it is the one from which I hung my high hammock. My hammock is the normal kind which is intended to be hung from two points. Since a branch offers only one point, I used a ten-foot long two-by-four board to separate the ends, allowing a comfortable spread across which to stretch out. A few people have commented that this solution is remarkably clever, but I have to disagree; I think it was obvious. The hammock is fun to swing in. The nearby tree trunk can be used to push off from, or one can swing the other way. The period of a swinging pendulum is a function of the length of the rope (or whatever) it is suspended by. In my case, it's about 35 feet tall, giving a period of about six seconds. That's nice and slow, but the cool young boy down the street makes me jealous with an even taller swing, and his swings with a period of about seven-and-a-half seconds.